You’ve either had them or never heard of them, love them or hate them, but there is no denying that Munchos is one of the longest running unique snack items on the market. Billed as a “potato crisp”, they are similar to a potato chip only in how they are consumed. The food substance in question resembles the Styrofoam of those old Federal Express toy airplanes and is practically transparent. Munchos is a fun food snack. Even just saying “Munchos” out loud is entertaining. I don’t recall the first time I had Munchos, I think Munchos have simply always had me. Somewhere early in life, my mom got a bag of Munchos and Fritos Mild Cheddar dip. The taste explosion was better than any gummy candy or chocolate covered goody I had experienced in life up to that point. In my mind, this was a regular snack combo of my mom’s. In reality, she probably only happened to try the dip and crisps one time. Nevertheless, the flavor sensation has lasted a lifetime. To this day, I can’t pick up a Munchos “$2 ONLY” bag without throwing in a can of the synthetic cheese-like dip that costs nearly double. 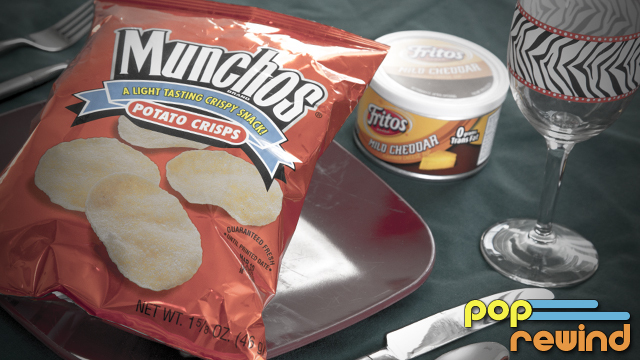 Munchos are great on their own, but that can of goo easily turns chips into a meal. Before I know it, I’ve eaten the whole bag and have nothing to show for it but an empty can of dip. Many lunches have been skipped due to a random craving of the treat. I feel like some master bachelor every time I make a secret Munchos run. So, what’s the deal with Munchos? I’ve searched and have yet to find a comparable product. This is pretty uncommon in the snack world, even in terms of Frito Lay products. Funyuns, for example, has several counterparts such as Rudolph’s Original OnYums and Wise Onion Rings. No, Munchos is in a class of its own, even when it comes to the signature crunch. Nothings else tastes or sounds like a handful of Munchos. Supposedly, the original marketing for Munchos and Pringles were very similar despite not being particularly similar. Over time, the two products carved their own identities on the snack aisles. Only Munchos, however, can lay claim to the origin of Cookie Monster. I eat them pretty much the same way. Yes, loveable puppet master Jim Henson was the genius behind the early Munchos television commercials. Before the fuzzy blue character we now know as Cookie Monster was hooked on chocolate chips, he was into the one of a kind potato crisp. Despite being introduced in 1969, Munchos feels like a relic snack of the 1980s that has somehow managed to lay low throughout time. It’s one of those food items that seems like it could be quietly discontinued at any moment, so I’m just grateful they’re still around. It’s as if there’s some agreement in place between Munchos and the marketing team along the terms of “You don’t require any extra work for us and keep to yourself, we’ll let you stay on shelves indefinitely.” The packaging has stayed relatively the same the last three decades. I remember being blown away when the “$2 ONLY” label was added to the bag a few years ago. Hey, it’s not often you get breaking news in the Munchos world. Over time, a Flamin’ Hot variation has shown up at dollar stores throughout the nation and, as appreciative as I am of a new flavor, nothing quite tops the original. I may sing a different tune if a Salt and Vinegar variety ever hits store shelves, though. Here’s hoping Munchos has enough of a dedicated following to slide through another thirty years of production. If it’s good enough for Cookie Monster, it’s good enough for me. Are there any obscure snacks you’ve secretly hoarded forever? Share in the comments! i realize i am reading this 2 years later, but i remember a salt and vinegar munchos back in the late 80’s or early 90’s. They were the best salt and vinegar snack i remember, but now cannot find them. Yes there was a Salt and Vinegar kind throughout the 90’s. I haven’t seen them since. I thought I was the only Muncho eater left! I have been looking for them at Kroger. Also I love them with the Frito cheese dip – the jalapeno version. Yummy and addictive! Salt and Vinegar Muchos were my favorite. Have seen them since the the mid to late 90’s. I would buy them more often if they came back on the shelf.